Virtual Reality is used successfully to treat people for regular phobias. A new challenge is to develop Virtual Reality Exposure Training for social skills. 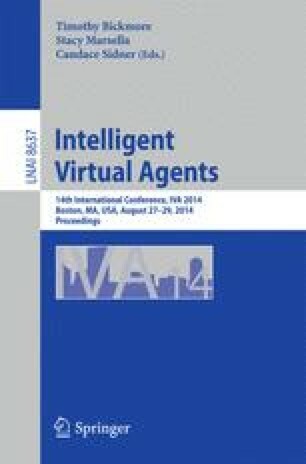 Virtual actors in such systems have to show appropriate social behavior including emotions, gaze, and keeping distance. The behavior must be realistic and real-time. Current approaches are usually based on heavy information processing in terms of behavior planning, scripting of behavior and use of predefined animations. We believe this limits the directness of human bodily reflexes and causes unrealistic responses and delay. We propose to investigate virtual reflexes as concurrent sensory-motor processes to control individual parts of the virtual actor’s skeleton with a body integrity model that keeps the effects coherent. We explain how emotion and cognitive modulation could be embedded, and give an example description of the interplay between emotion and a reflex.